The town of Salem is Hell on Earth. That’s a fact that has always been part of the show, though until now, it had never really been said outright. But the combination of monstrous, hypocritical Puritans and monstrous, diabolical witches have made up the town’s DNA from the opening moments of the entire series. 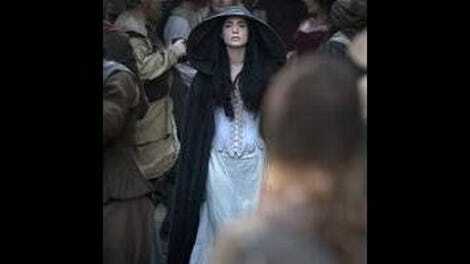 To willingly live in Salem either shows an unflinching bravery, a nefarious motive, or an amazing glibness. Sometimes it’s all three of those things. For most of the series, however, Mary Sibley has worked to bring Hell from beneath the people of Salem right up to them. Despite all of her pain and suffering, it never occurred to her that she was already literally in Hell on Earth. Her idea of Hell meant punishment for the Puritans, but are they not already in a state of constant punishment? That’s one of the questions “On Earth As In Hell” asks and answers, and as such the way the audience looks at Salem is also called into question. “On Earth As In Hell” also brings up the question of what kind of a world Salem is with a weak and defeated Mary Sibley. What kind of a show is Salem with a weak and defeated Mary Sibley? In the case of the former, it’s the ultimate example of the pathetic, hypocritical world that Mary Sibley herself had sworn to wreak vengeance upon. She loses her last name (both Sibley and her maiden name) and all of her Puritan power, all while the people who once held her in reverence throw rotten food at her. In the case of the show, it becomes a case where it is not fully itself, stuck in a holding pattern as its best character loses almost everything that makes her so dynamic. She’s absolutely down to her last, and while that’s an interesting choice for the show to make, it really does change it completely. It’s intentional, but as we all know, the road to Hell (or an off-kilter episode of Salem) is paved with good intentions. One of the things that’s been so fascinating about this season of Salem is its willingness to visually experiment and not stick with one look for every episode, and it’s a winning decision. The episode takes a different approach than most Salem episodes in its depiction of the horror that is this world, as it is perhaps the most well-lit episode of the series. That sounds strange to address, but it a show as grey and dark as Salem, something like that sticks out. The harsh light of day washes over nearly every scene in this episode, and the irony is not at all lost on that choice. As the sun beams over Salem, Mary’s sins of fornication and adultery on display, it’s clear to see all of the townspeople as they turn on her in an instant. This isn’t a night time congregation where people can easily slip away back to their homes and pretend they never engaged in such behavior; they immediate attend a service for dead George Sibley after the fact, heads held high as though they deserve no judgment. There’s nowhere for them to hide as their true colors show, while they act as though Mary Sibley’s true colors—which included caked on make-up to truly display her Jezebel ways—are the ones for all to see. When Isaac shows up with Dollie’s dead body and a huge chip on his shoulder, he addresses all of this, but it falls on deaf ears. As much as the episode wants to evoke the senses, the citizens of Salem do best to dull such things in order to go on living. Meanwhile, the not-so-hidden darkness within John Jr. amakes an appearance as John and Cotton attempt to exorcise him of the Devil. It’s the storyline that takes up most of the episode, which is sadly also a factor in the episode feeling askew—as compelling as other storylines can be, Mary’s status during those other storylines can interfere with the interest. This is an episode where Mary is more than willing to kill herself in order to save her son, so it’s a bit of a disappointment to watch John be tricked both by the Devil and then the Countess in his own attempts to do the same. It obviously wouldn’t be so easily to exorcise the Devil from the boy, but after the Countess mentions early in the episode that such a thing would kill John Jr., the plot itself doesn’t really deliver outside of the horror aspect. The horror of it all is actually what saves it, as the scenes where the Devil peeks out of John Jr. and the Countess comes to kiss John are absolutely absolutely terrifying, thanks to the work of episode director Nick Copus (“Cry Havoc,” “Ill Met By Moonlight”). The line that Anne (or “Anne”) says to close the episode confirms the point this whole episode is trying to make: “There’s something inside all of us.” That’s the story that Salem is telling, and as it goes on, there doesn’t appear to be much good in most of the people who are part of it. Whether it be a literal monster or just the figurative one with all of them—or it be the genuine goodness, fighting to get out—something is driving these people to play their parts in this witch war. No matter what, it’s fascinating to watch. Sebastian’s mommy issues grow stronger this week, as all he wants in this situation in Mary, and the Countess wants her dead, to say the very least. The fact that he thinks he’s still going to have his mother’s enemy at the end of this shows just how delusional he is. Of course Isaac receives more punishment for telling the people of Salem like it is (in quite the heartbreaking scene). I have to believe one day he’ll get a real win. Cotton now knows Mary is a witch. Soon everyone will know Mary is a witch. The first rule of witch club has been broken too many times. Too many times. Anne pep talking the absolutely crushed Mary is one of the best scenes of the episode, unexpectedly delightful while also surreal. The stripped, honest Mary is the one that finally gets Anne’s full attention and respect. Go figure. Mary: “No, I no longer have faithi n my magic. It has brought me and everyone around me nothing but misery and death.” Yes, yes it has, Mary. But that’s why we love you. Mercy remains absent, which seriously makes me fall on the side of her being an extraneous part of the plot. Her contributions to Team Countess and her possible competition with Sebastian have merely fallen by the wayside. Was it really worth it for all those weeks of burned Mercy voice?